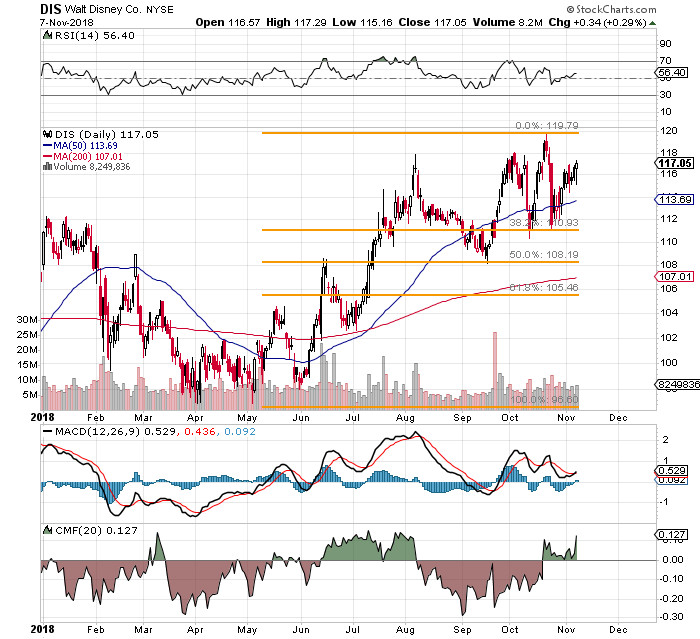 DIS reports Q4 tonight and most important will be the progress made for their direct-to-consumer business lines. Ring the Disney register? Whoa. Got your attention, didn't I? Listen, I am not going to take my entire stake off of the table. I like the Walt Disney Co (DIS - Get Report) , I have some nice gains in the name and this stock has not yet reached my target price of $122. So, why then would I make a sale. Let me explain. The mighty House of the Mouse will report its fourth-quarter results tonight after the closing bell. EPS expectations are for $1.34, or 22% year-over-year growth. Whispers I have seen are in between $1.31 and $1.33. Revenue growth is projected at 8% over last year. One thing I do not expect to impact the share price will be those numbers, as long as they are "ballpark" close. What will matter more to me as an investor will be comments made on the integration of the assets purchased from Twentieth Century Fox (FOXA . Also important will be comments made on theme park performance as well as studio performance. Most important, however, will be the progress made for the firm's direct-to-consumer business lines. In other words, how well is ESPN plus (launched six months ago) actually doing? And how is the stand-alone streaming service, planned to launch sometime in calendar year 2019, actually progressing? This is key. I want to hear something on the impact on margins of the Fox acquisition and the spending on building this streaming television infrastructure. I am not worried, obviously, about content. Disney has plenty of that. And much of it, contractually, will be permitted to come home some time next year. (Yes, that's a shot at you, Netflix (NFLX - Get Report) ). The stock does come into earnings with Relative Strength, Money Flow, and the daily MACD all in the best shape we have seen these indicators as a group since early September. We also see this name hitting resistance in nearly the same neighborhood (in a ballpark sort of way) for the fourth time in three months' time. That only matters if the shares sell off overnight. My target of $122 is still realistic. Obvious support levels appear close to $111 and $108. Though I am going to shave my long in this name today, I will go into these results long DIS and short some put options. The intent is to cover as many bases as possible while either driving revenue, or forcing myself to buy back shares at a discount. Understand that in the event of a collapse in share price, by selling something now and buying it back cheaper (potentially), even if I end up paying above market value at the time, I will have successfully extracted capital from a position that was making my spider sense tingle. This is simply about risk management. Unsure? Sell enough to be comfortable. Are you willing to pay $104.40 next month for a stock that closed at $117.05 last night? Now, would you pay $93.85 in six months for that same name that closed at $117.05? The risk/reward appears to favor this option, at least for this urban cowboy. At the time of publication, Stephen Guilfoyle was Long DIS equity, Short DIS.